We had such a good thanksgiving this year! We started off with a day full of eating at my cousins house. Lots of appetizers, treats, traditional Thanksgiving food, and BUNKO! We also played a lot of Wii bowling and guitar hero. Then on Friday, I made or convinced Jacob to go early morning shopping with me. Melis sadly couldn't go so we had to brave the crazies by ourselves. We showed up at 4:45 a.m. at Circuit City and there were already a couple hundred people in front of us. After 20 or so minutes in the cold we made it in the doors and got the movies we were looking for. For only $3!!! Then we headed to Target to brave the crowds there. CRAZY!!!!! There were so many people. Jacob and I separated to find what we wanted and got lost for a little bit. Thankfully we found each other and everything we went shopping for. I felt like I was in a mosh pit. Then we had Thanksgiving at the Benson's. 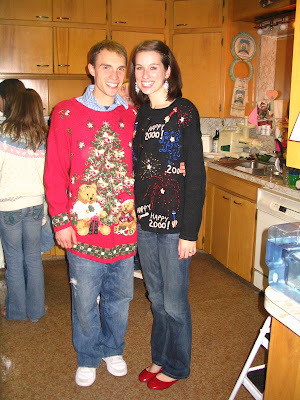 After dinner we had the First Annual Ugly Sweater Contest. The picture of ours is above. We found the sweaters at Savers. Mine had a smell. And Yes. It has fireworks and says Happy 2000. And Jacob's is self explanatory. After some intense voting... JACOB WON!!!!!!!!!!!!! We were so excited and love our trophy! Jacob is holding it in the picture below. 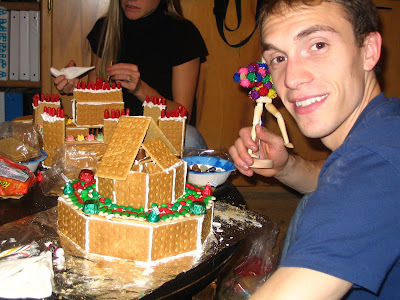 Then we started the Gingerbread house making, which is graham crackers, candy, frosting, and glue guns. That is Jacob's above. It had a really cool design in the middle. I made mine into a zoo. 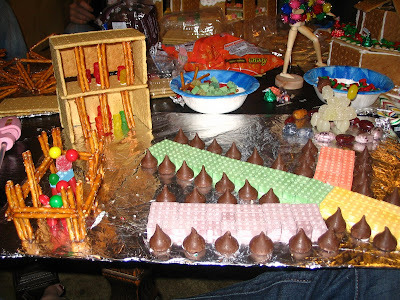 The animal in the back was supposed to be a polar bear, but then It added a hershey's kiss and it looked like a unicorn. with 6 legs. A weird creature even in a fantasy land. We had such a great Thanksgiving. What a great way to start of the Holidays!